In order to identify high-risk patients in a clinical setting, a simple system for screening is needed which is easy to use, reliable and gives results which are easy to interpret and can be immediately available to both the patient and staff. 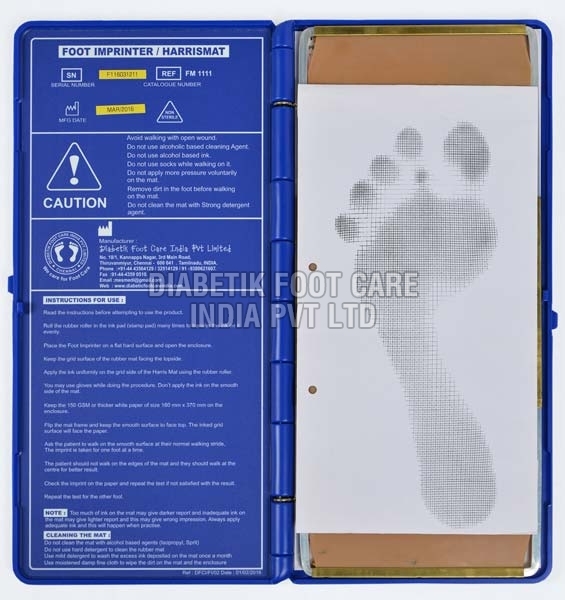 Our Foot Imprinter Harris Mat FM1111 has been developed as a simple, inexpensive and practical foot pressure measurement device intended for routing clinical use. It is a semiquantitative footprint mat which quantifies plantar pressure by visual comparison between the greyness of the footprint. Excellent tool for motivating the patient to upgrade to a better and functional footwear. Full Kit include FM1111 Harris Mat, Rubber roller, Ink pad, Ink and Recording Paper(100 sheets).